As part of the celebration of our premier art scene, the Sydney Festival, Debashish Bhattacharya, the inventor of several revolutionary versions of the guitar, recently played at the prestigious City Recital Hall at Martin Place. "The Sydney audience is a remarkable mix of people from various parts of the world and the Sydney Festival cherishes and celebrates diverse cultures. I thought it would be significant to present and share a deeper meaning to the concept of the Past, Present and Future of Indian Classical Music to the audience here," Bhattacharya told Indian Link after the performance. Hailing from Kolkata, Debashish learned music from his parents who are Hindustani classical vocalists. "Nobody in my family ever played the guitar. When I was two, my father gifted me a Hawaiian guitar and my mother taught me the sargam on it, the do re mi fa so la ti of Hindustani classical music,"Bhattacharya reminisced. 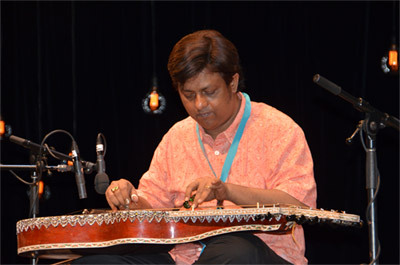 Debashish Bhattacharya learned the art of singing, and mastered the techniques of playing the guitar, sitar and the sarod, but often felt restricted as a music composer by the limited possibilities that these string instruments offered. So, at the age of 15, he amalgamated the tones of the Rudra-veena, violin, sarod and sitar into one and created the Chaturangui - the first of the 'Trinity of Guitars'. "I didn't want to play the sarod, sitar or veena on my guitar. I wanted that infinite soundscape, the nuances and the resonances of these different instruments - all in my guitar," Bhattacharya explained. He also created the Gandharvi, a blend of the Saraswathi-veena, santoor, sarangi with the acoustics of a 12-string guitar and Anandi, which produces exotic folk lute-like tones, accepted as the slide-ukulele worldwide. The 'Trinity of Guitars' are each different from the other in terms of design, string arrangement, performance techniques, resonance and sounds they produce. They have distinct identities and temperament. Accompanied by his daughter Anandi on vocals, tabla player Tanmoy Bose, and Australian singer-songwriter and slide guitarist Jeff Lang, Debashish Bhattacharya played each of the guitars, specific to the composition and tone of the tracks during his Sydney performance. He used the Gandharvi to play 'Reflections' from his recent album Beyond the Ragasphere, a jazz and Indian classical fusion music album, and for 'Mystical morning' the Chaturangui, produced sheer magic. "I selected Gandharvi to play 'Maya' (from the 2009 Grammy-nominated album Calcutta Chronicles: Indian Slide Guitar Odyssey) because only Gandharvi can reflect the personality of the song. 'Maya' is based on raga Kalavati and the composition matches the personality and soundscape of Gandharvi," Bhattacharya explained. Anandi, 17, sang raga Yaman while Debashish played raga Jinjhoti for 'JD2 delusion', a track from his latest release Beyond the Ragasphere. An exhilarating part of the concert was Bhattacharya's jugalbandi with Tanmoy's tabla, a popular composition originally performed by Ustad Baba Alauddeen Khan, Pandit Ravi Shankar and Ustad Ali Akbar Khan. Bhattacharya's trio concluded the concert with a Sufi Bhakti piece, leaving the audience enchanted. 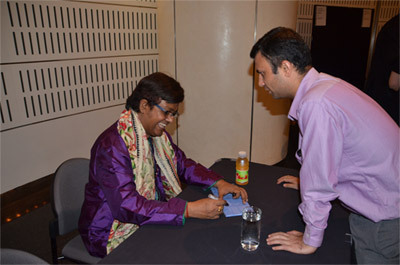 Debashish Bhattacharya has been recognised worldwide for his unique musical ability. In 2009 he was nominated for a prestigious Grammy Award. He has also been featured in the Billboard Top 10, Song Line Magazine top 10, Central Asia and Asia Pacific World Music top 10, and bagged the 2007 BBC Planet Award, the 2005 Asiatic Society Gold medal and the 1984 President of India Gold Medal to name a few. Celebrating the Indian classical slide guitar and to promote aspiring talent, Debashish along with vocalist Pandit Vijay Kichlu, Tanmoy Bose and Anindo Chatterjee, recently hosted a five-day India International Guitar Festival 2015 (IIGF) in India, in a tribute to his guru Pt Brij Bhushan Kabra.